Luxury apartments are located in the center of Yalta, on one street - Chekhov - this is the first line of the Yalta embankment. You can choose one or two-bedroom apartments equipped with everything you need for a comfortable stay. Each apartment is equipped with a kitchen (stove, refrigerator, kettle, dishes), air conditioning, iron and ironing board. Two equipped beaches - Massandra and Urban are located 5-10 minutes walk. Nearby is the concert hall "Jubilee", the cinema "Spartacus", the theater named after. Chekhov, as well as ATMs, 24-hour shops, restaurants, cafes, entertainment centers, sightseeing points, parking spaces. Distance to the bus station in Yalta - 3.5 km, to the city Simferopol - 84 km. PRICES MAY CHANGE, IT IS REQUIRED TO RECEIVE INFORMATION FROM THE OPERATOR. Description of the room: Area hotel "Oreanda" and the area of ​​the cinema "Spartacus", near the beach seaside (5-7 minutes walk). Double bed, armchair, bedside tables, mirror cupboard, air conditioning. Equipped kitchenette (gas cooker, kettle, refrigerator). Small hallway. Summer patio for rest. Parking by the house. Description of the room: The studio is located on the 3rd floor of a 3-storey private house. Parking on the territory of the house is under protection. The apartment has a large double bed, air conditioning, wardrobe, mirror, TV, internet, the bathroom has a bath. Spacious balcony with outdoor furniture. Equipped kitchenette (gas cooker, hood, kettle, refrigerator, dishes). The apartment is located in front of the concert hall Jubilee, this is the middle of the Yalta embankment. Description of the room: Two separate bedrooms with wide double beds, large entrance hall with extra bed (pull-out sofa), kitchen, bathroom. A small summer corner for outdoor recreation. The area is 74 sq.m. Parking in front of the house. Description of the room: Bunk apartment with balcony. On the ground floor there is a kitchen, an entrance hall, a bathroom, a dressing room, a sleeper (pull out sofa), TV, air conditioning. On the second floor there is a bedroom with a balcony. The bedroom has a large double bed, TV, air conditioning, extra bathroom (bath), exit to the balcony with outdoor furniture. Parking in front of the house. To the sea - 50 meters. Description of the room: The apartment is located on the second floor of a 3-storey building. Two beds (a double bed and a soft corner sliding), wardrobe, kitchen with a set of dishes and a dining table, internet. One room is through. Parking by the house or on a paid car park 150 meters away. 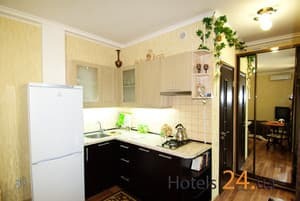 Description of the room: The apartment is located on the 3rd floor of a 3-storey private house, opposite the Jubilee Concert Hall, this is the middle of the Yalta Embankment. Parking on the territory of the house is under protection. The apartment has a separate bedroom with a large double bed, TV, air conditioning, access to a spacious equipped balcony. Kitchen-studio with built-in furniture, crockery, kitchen table and extra bed (soft leather pull-out sofa). The bathroom has a bathtub and washing machine. The dressing room is in the bedroom. Luxury apartments are located in the center of Yalta, on one street - Chekhov - this is the first line of the Yalta embankment. 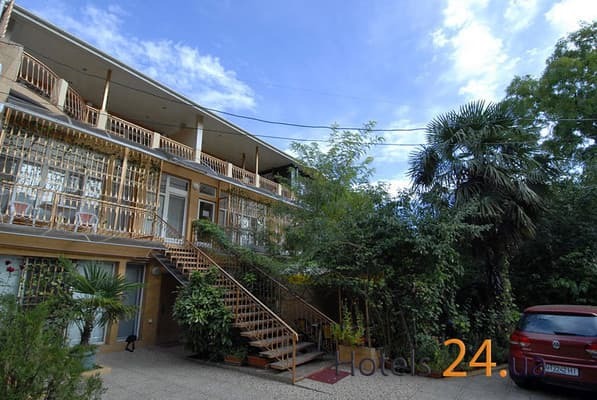 Two equipped beaches - Massandra and Urban are located 5-10 minutes walk. Nearby is the concert hall "Jubilee", the cinema "Spartacus", the theater named after. Chekhov, as well as ATMs, 24-hour shops, restaurants, cafes, entertainment centers, sightseeing points, parking spaces. Distance to the bus station in Yalta - 3.5 km, to the city Simferopol - 84 km.